Location: Just 10minutes away by boat from Mahé, making it a convenient stepping-stone for island hopping in the Seychelles. The Sainte Anne Resort & Spa is located on the 200 hectare private island of Sainte Anne in the Seychelles archipelago. 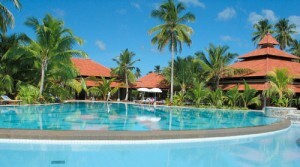 The Sainte Anne Resort is an exclusive resort which has just undergone major refurbishment and is a magnificent retreat surrounded by three fabulous beaches and clear glistening sea. Accommodation: The accommodation is villa style and each spacious villa has a secluded garden with views of the sea and a furnished gazebo for either relaxing or dining al fresco. 87 air-conditioned villas with; bath, shower, outside shower, mini bar, safe, hairdryer, satellite TV, tea/coffee facilities, and patio with gazebo. 28 villas now have private pools. Ocean villas are closer to the beach. One and two bedroom villas are available and the spectacular Royal Villa has three bedrooms. Fitness centre offering the latest equipment. Variety of free water sports. Supervised Bob Marlin Mini Club for children 3 to 12 years.